In spite of her innumerable linguistic, ethnic, historical and regional diversities, India has had from time immemorial a strong sense of cultural unity. It was, however, Swami Vivekananda who revealed the true foundations of this culture and thus clearly defined and strengthened the sense of unity as a nation. Swamiji gave Indians proper understanding of their country’s great spiritual heritage and thus gave them pride in their past. Furthermore, he pointed out to Indians the drawbacks of Western culture and the need for India’s contribution to overcome these drawbacks. In this way Swamiji made India a nation with a global mission. 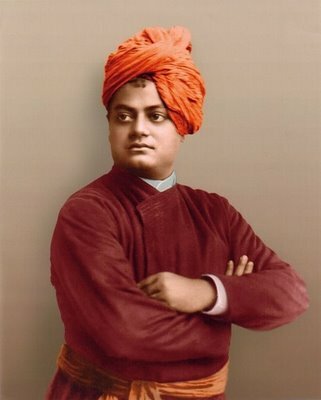 Swamiji’s most unique contribution to the creation of new India was to open the minds of Indians to their duty to the downtrodden masses. Long before the ideas of Karl Marx were known in India, Swamiji spoke about the role of the labouring classes in the production of the country’s wealth. Swamiji was the first religious leader in India to speak for the masses, formulate a definite philosophy of service, and organize large-scale social service. This is the gist of all worship – to be pure and to do good to others. He who sees Siva in the poor, in the weak, and in the diseased, really worships Siva, and if he sees Siva only in the image, his worship is but preliminary. He who has served and helped one poor man seeing Siva in him, without thinking of his cast, creed, or race, or anything, with him Siva is more pleased than with the man who sees Him only in temples. It is impossible to find God outside of ourselves. Our own souls contribute all of the divinity that is outside of us. We are the greatest temple. The objectification is only a faint imitation of what we see within ourselves. To succeed, you must have tremendous perseverance, tremendous will. “I will drink the ocean,” says the persevering soul, “at my will mountains will crumble up.” Have that sort of energy, that sort of will, work hard, and you will reach the goal. Stand up for God; let the world go. Giving up all other thoughts, with the whole mind day and night worship God. Thus being worshipped day and night, He reveals himself and makes His worshippers feel His presence. “Let us proclaim to every soul..- Arise, awake and stop not till the goal is reached.Arise, Awake from hypnotism of this weakness.